25 years ago, in a small south Wales mining village, Manic Street Preachers began a crusade to torch rock’n’roll and rebuild it in their own lipsticked, literary image. They succeeded. As one of the most important and visceral bands of the last quarter of a century prepare to bow out, NME joins Nicky, James and Sean to reflect on their legacy and rank every single from one to forty. What will top the list? ‘A Design For Life’? ‘Motown Junk’? Find out inside! 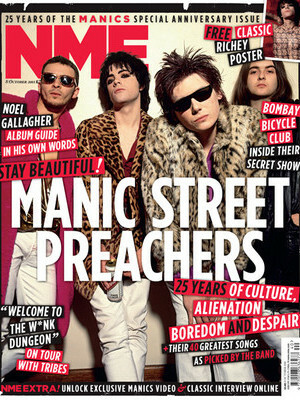 Plus free for every reader, NME Extra brings you aload of exclusive hidden content online, including an exclusive Manics video interview, a classic Manics feature from 1994 and the chance to win a deluxe edition of their ‘National Treasures’ singles box-set. Plus loads of other extras. and a free Richie Manic poster with every issue! As well as all that, we join Florence as she makes her live comeback and spouts about pirates, The Maccabees talk about how their new record is their most ambitious yet (and sounds like a “never ending drone”), and we chart the rise of Noah And The Whale’s Charlie Fink from shy folkie to hip swinging rock icon. Plus read the verdict on Bjork’s highly ambitious ‘Biophillia’ album, find out if Arctic Monkeys have finally cracked the States, and find out who’s playing where via the UK’s biggest and best gig guide.